Check out more of Stephanie McMillan’s Code Green comics here. 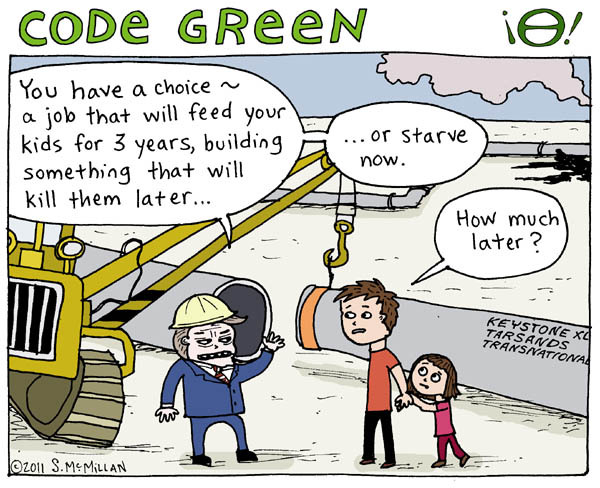 The following text was posted on McMillan’s site accompanying the Wage Slave Dilemma comic: “The capitalist system sets up a false jobs vs. environment conflict, that serves the system on both sides. If people’s land wasn’t stolen and destroyed, they wouldn’t be able to be forced into a position of dependency and into the labor force in the first place. ← Can Deep Green Resistance bridge the gap between two political prisoners in Utah?